Even if you’re not someone who likes to join the bandwagon as the trends change, you’ll want to know about the fun trends that are spreading like wildfire across the wedding industry this year. Starting from the colour of the year, to drink and food pairings, flower trends, and non-traditional trends, here’s a look at some of the 2018 wedding trends that may be an inspiration for your own wedding. For people who go by the Pantone colour trends, the colour of the year 2018 is ultra violet purple. If you prefer purple to pink, you’re in luck. You can bring in purple flowers, table decor, purple crystals and bling it up with accents in silver or gold. As for flowers, you can go for a monochromatic purple look or add touches of lilac, violet, lavender and burgundy with roses, dahlias, peonies and anemones. There seems to be a growing trend of pearly, translucent accents at weddings. Whether you wear a crown of shimmery lunaria or bring in holographic stationery, there are many ways of introducing this lovely trend. Wedding dresses are also a great way to incorporate embellishment if sparkle isn’t really your thing. Some of the more stylish weddings of 2017 already had beautiful hanging flower installations. But 2018 will see more creative flowers and greenery for guests to look up at. Your tables are freed up too, for setting up candles and sharing plates for lots of delicious food! 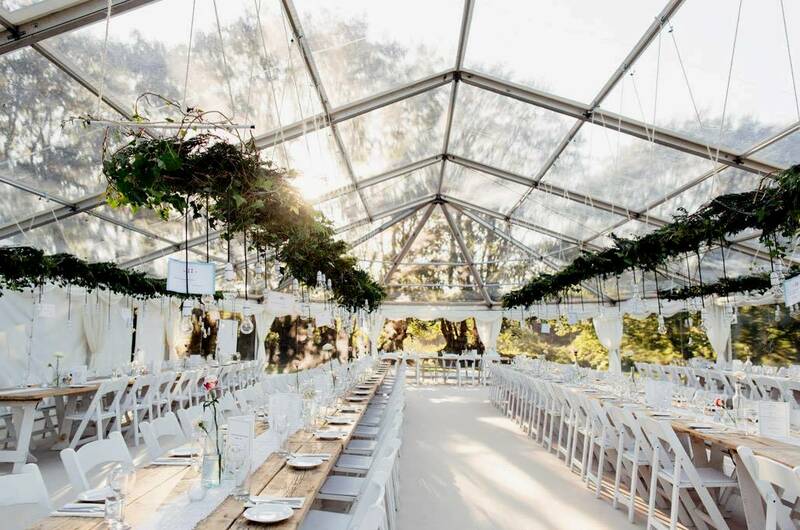 Clear glass marquees that reveal the sky above the wedding party as they dine is a popular trend this season. You get uninterrupted views of the sky as you’re dancing at twilight, too. Combined with the trend of hanging foliage and flowers, the glass marquee can make a memorable way to bring the outdoors in to your wedding. Natural light is a big part of the 2018 wedding trends too. Another growing trend is the use of industrial-venues. A couple recently got married in an abandoned mill. You don’t have to do the same. But the point is the stripped-down look of the wedding venue. You can really do anything you like with this concept, in terms of decor and make it as glamorous and luxurious as you like. African, especially Nigerian weddings continue to traditionally be big, and rightly so! Afterall, this is the one opportunity you and your family get to celebrate your new found love, and the beginning of your Happily Ever After. If your preference is a small intimate wedding with just your nearest and dearest, or if your dream is getting married on a Bali beach or having a traditional Thai wedding, this is the wedding for you. What’s different this year is that the wedding couple (and guests) will embrace local culture – salsa in Spain, for instance, can be on the entertainment itinerary. Another toothsome trend to embrace is the growing popularity of edible place holders. This could be chocolate, delectable hors d’oeuvres, cookies, what have you. But even if your traditional place holders are in vases or created using plants, it will be special and trendy. What are your favourite 2018 wedding trends?